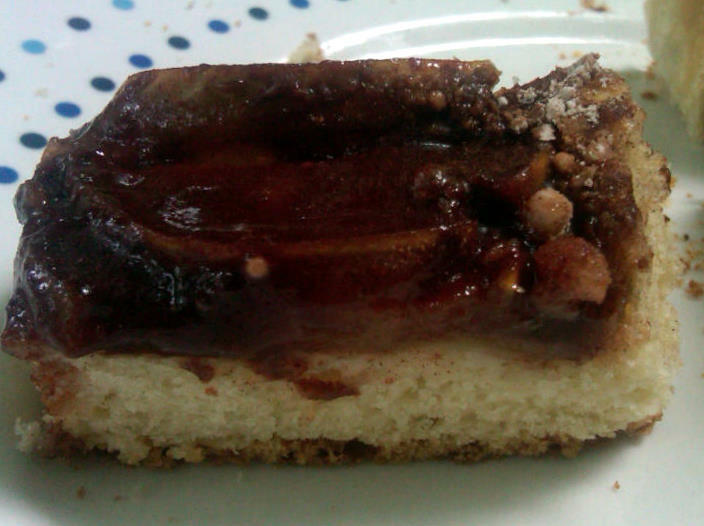 This cake is like a lot of guys I dated -- they had possibilities, but needed some *work* to reach boyfriend perfection. 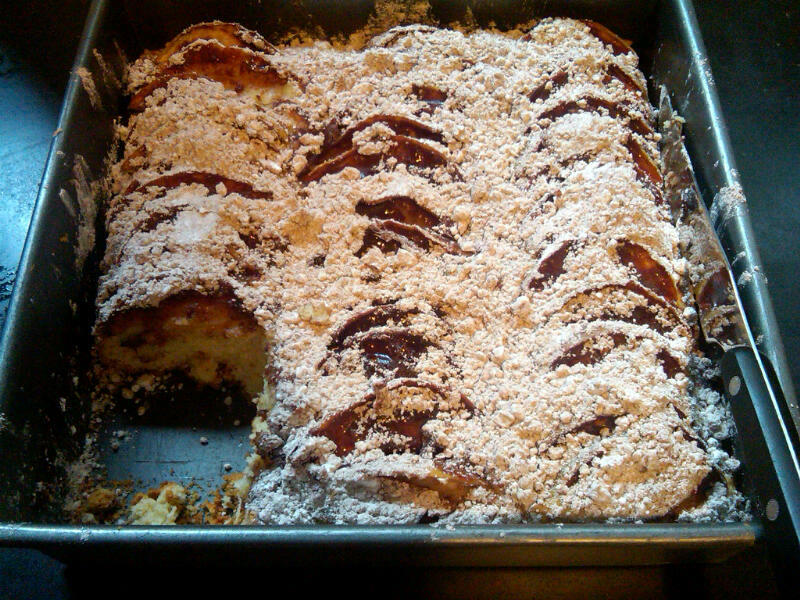 And so it is with Cheese Apple Cake -- an excellent and unusual cake, but one whose execution needs a bit of tweaking to make it as good as it can be. This is, in fact, not a cake but a very large biscuit flavored with cheese. Not that there's anything wrong with that! 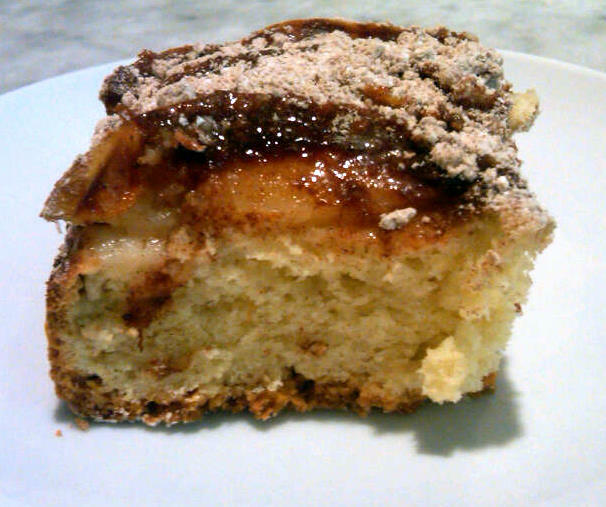 I've never been a fan of the cheese and apple pie combination, but if you are, this may be the perfect cake for you. 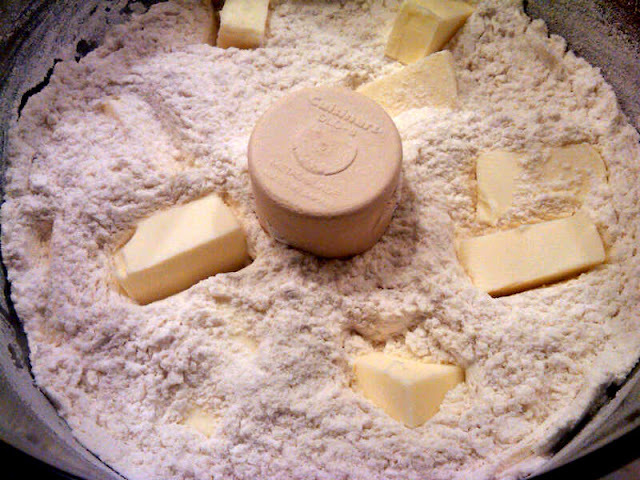 The bottom (biscuit) layer is made by cutting the butter into the flour, a normally tedious task made easy with a food processor. 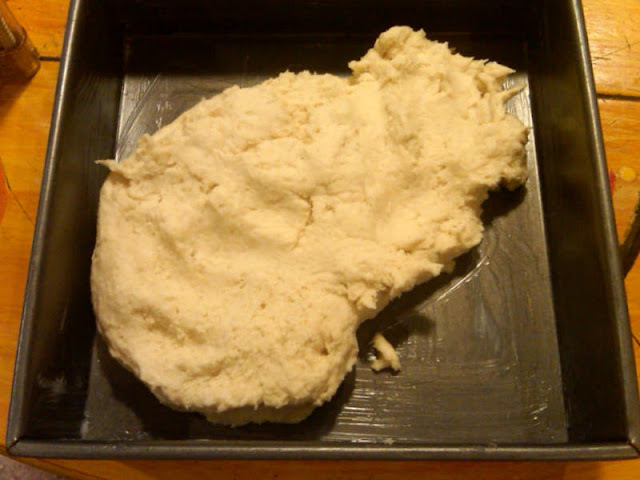 Just cut cold butter into chunks, add to the flour and pulse until the butter is the size of small peas, or smaller. 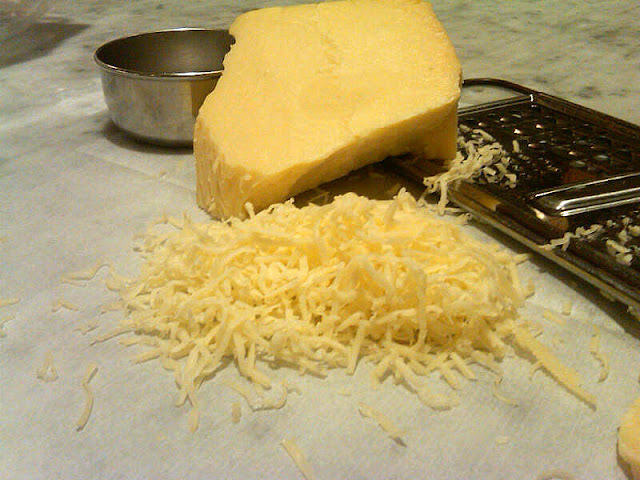 After the butter is incorporated, add the rest of the ingredients, including grated cheese. When the batter is all mixed and you place it in the pan, it will look like it does below. You need to gently press it down until it is evenly distributed so that the entire bottom of the pan is covered. 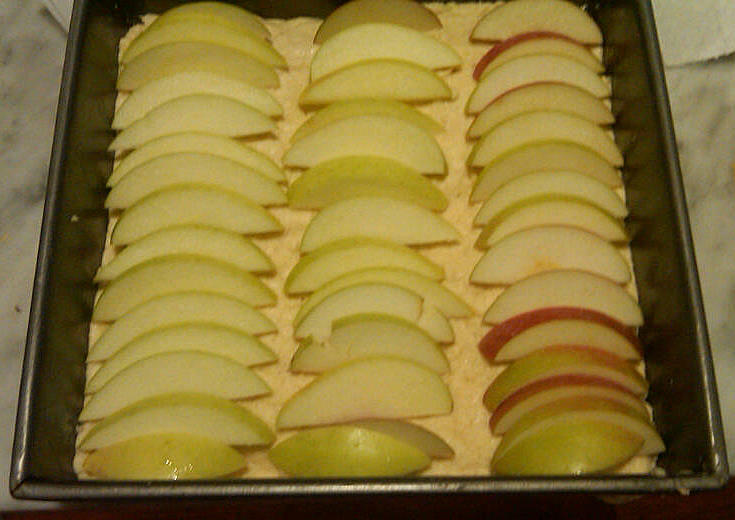 Next, slice some apples -- I used about three or four medium ones -- and arrange them atop the bottom layer. The arrangement, like most relationships, need not be perfect to work. As a fan of cheddar on apple pie, I think I'll have to try this. The "biscuit"/cheese aspect may even convince my husband to try a bite. Thanks for all the comments, guys. 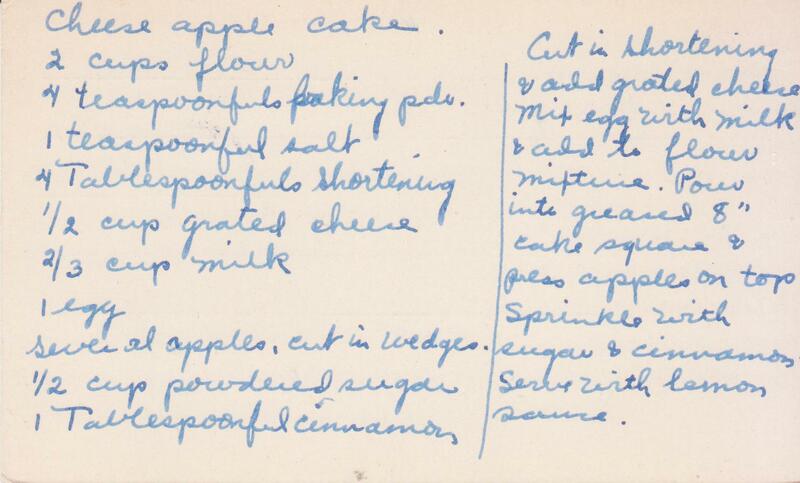 I wonder if this recipe pre-dates the slice o' cheddar on apple pie. SugarBeam, let me know if you sub the cream cheese for the cheddar -- it would make for a very rich bottom layer, I'd imagine. Vincent, I will check out Petitchef, thanks. Thanks for posting. This sounds like a yummy recipe I would like to try. What temperature and for how long did you bake this at?